I have purchased this product twice, I am almost out of it and only have a few uses left and thought I would share my opinion. These photos were taken from my Haul in mid October which is why the compact is full. The 'Some kinda Gorgeous' is marketed as a foundation faker meaning that it's supposed to look like skin and not foundation. I would have to agree as it contains no shimmer, illuminating properties or anything that wouldn't naturally be on the skin. 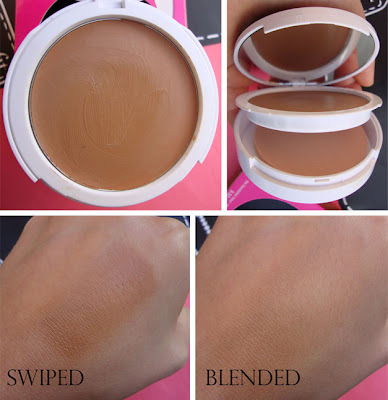 I would say it's similar to a 'cream to powder' formulation without it actually turning to powder, and what I mean by that is that there is no cakeyness or powdery residue and instead you are left with a matte velvet finish. However, saying that I mainly used this for contouring and bronzing with a small fluffy brush. It's a bit too dark to use all over my face without a tan. I would compare this to the Chanel bronze universal but a more natural version of it. Overall I love the product, but don't think I will be repurchasing as I'm determined to use up my other bronzers! Packaging: I don't like it, it looks cheap - who likes white plastic? Not me. Ou, I got this as a gift last Christmas. It definitely didn't blend in with my skin or match my skin tone but that was expected. And I agree with the packaging! I'm not a fan of Benefit's design but it's different from the "black" packaging that 234243 other make-up brands have, I suppose. Happy belated birthday! Wishing you and your loved ones a happy, healthy and prosperous 2010! Thanks for all the great reviews! It is so great to see you do a review on this because I just bought it! So far so good...I also use it for contouring. Now I want to try the Chanel Bronze Universal - I'd never heard about it before. I like some of Benefit's products - but their skin shades don't suit me - right now I'm using up their concealer stick as an eyeshadow base - it is SO far from my skin colour LOL! Do you have Coralista by Benefit - I'd love to try that - but I'm worried it might be too sparkly. @imo it only comes in 2 shades, the normal one and 'deep' which is the one I have.